Sandnes Idrettspark is a multi-purpose sports stadium located in the city and municipality of Sandnes in Rogaland county. 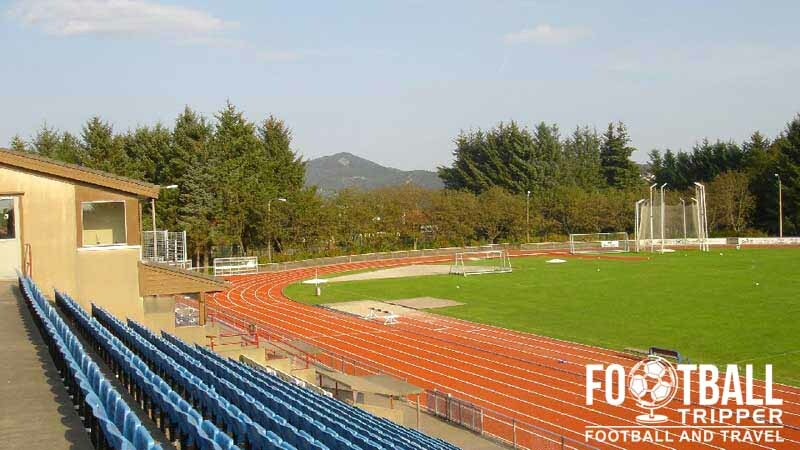 Since opening, the 4,969 capacity ground has been the home of local football team Sandnes Ulf, but is also strongly associated with track and field having hosted the Norwegian Athletics Championships in 1986, 2002 and 2010. A more detailed history section will be added in due course. Sandnes Idrettspark Stadion is comprised of four stands: North, East, South and West. 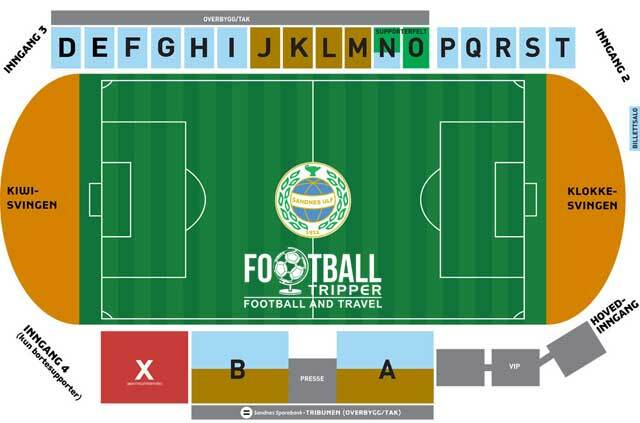 Away fans (Bortesupportere) are housed within the north-west side of the pitch within the seating area closest to the corner flag as per the above seating plan. Visiting supporters can gain access to the away section (Red X section) from Inngang (entrance) 4. Official merchandise of Sandnes Ulf can be browsed and bought from the club’s official online store. 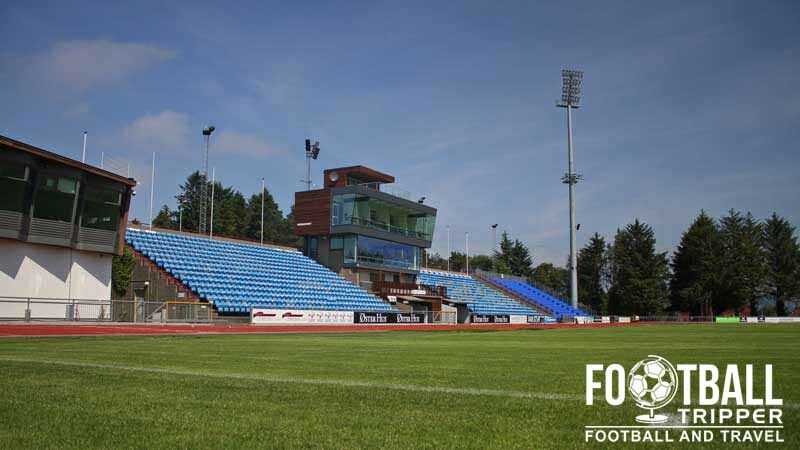 We sincerely doubt guided tours of Sandnes Idrettspark are available as a tourist attraction! Tickets to see Sandnes Ulf can be purchased through the two typical Norwegian channels: Online from the links on the official website, and from the ticket booths at the stadium which are open on matchdays 30 minutes before kick-off. The football ground is located within Sandnes Idrettspark approximately 1.2 km north-west of the city centre where the Sentrum station is located. For most Football Tripper you’re looking at a walk of around 10 minutes to the ground. Mostly you’ll be following “Tronesgeilen” northwards. There is a modest sized car park next to the training pitch however whether or not it’s accessible to the general public on matchdays is unclear. The city is served by two railway stations which are less than 650 metres apart. As the name implies Sandnes Sentrum is the more centrally located of the two, with Sandnes Station the original and main one of the city before being replaced by Sentrum in 1996. The closest major airport is Stavanger International in Sola which is approximately 12 km north-west of the municipality of Sandnes. It is Norway’s third largest airport in terms of passengers numbers, and is served by a decent range of airlines. The best priced option appears to be Hotel Sverre which is three stars and located just outside central station. The other options such as Quality Hotel and Gamlaværket AS are all at least four stars and subsequently much more expensive.